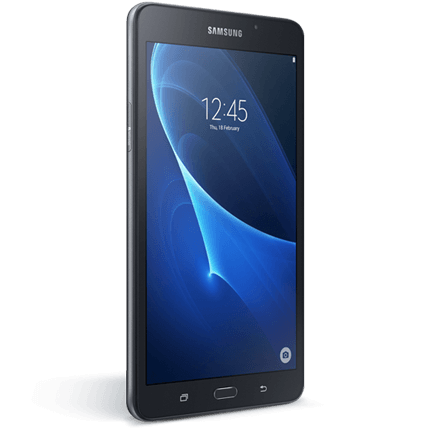 Looking for the Samsung Galaxy Tab A 2016 10.1? The Samsung Galaxy Tab A 2016 7.0 is small enough to take with you wherever you go, and has a large 7 inch touchscreen display, so you can keep on top of your favourite TV shows when you're out and about. Background noise at the office. Chill out time on the train. Listen to your favourite songs on the Galaxy Tab A 2016 7.0, whenever you want. You can load up to 50,000 tracks from your own computer to Google Play, and listen to them all day. Powered by Android, the Tab A 2016 7.0 gives you the look, feel and features you'll be used to, if you've already got an Android smartphone. And even if you haven't, it's easy to find your way around, and make the most of all that Android has to offer. With Kids Mode, you can hand over the Tab A to your little ones, safe in the knowledge they won't be seeing anything they shouldn't. So you can both relax on those long journeys.